Senator John McCain slammed President Obama over his comments that U.S. intelligence underestimated ISIS and how their expansion in Syria and Iraq was tied to the President’s decision not to leave a residual U.S. military force in Iraq and his refusal to arm moderate Syrian rebels last year despite urging from his national security advisers. “”We predicted this and watched it,” McCain said on CNN’s “New Day.” “It was like watching a train wreck and warning every step of the way that this was happening.”” how legislators who focus on the November midterm elections without voting on U.S. military action in Syria.””It’s an act of cowardice on the part of Congress,” McCain said. “They didn’t want to vote before the election.”” Than House speaker John Boehner said ” he would be “happy” to call lawmakers back to the House floor for a vote if Obama submits a resolution to Congress.” “”I’d bring the Congress back,” Boehner said'” Rep. Ed Royce chairman of the House Foreign Affairs Committee even said Obama is a political failure that he needs to lead. Commander in chief to lay out the strategy that Obama wants. Royce said. 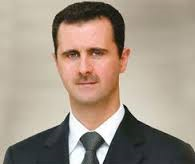 “We have given him those tools.” Obama has the power to attack al-Assad’s regime without congressional authorization and if he doesn’t then he is “immoral”. 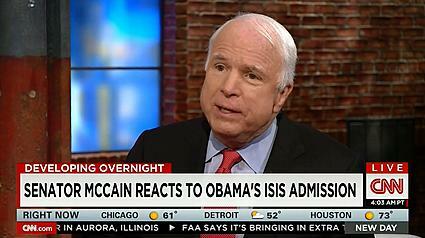 But McCain did agreed with the Obama administration that the United States is at war with ISIS. In this article McCain criticized Obama’s power of Commander and Chief because he is not taking action about ISIS and Bashar al-Assad’s, not making a plan or strategy to destroy them. He has the tools to but he has not made one yet which it is making the progress longer. McCain is the watch dog for the Republican so if Obama does something wrong, makes a bad decision or does not make progress then McCain will tell his co-workers and will start questioning the President’s actions. It is hard to be a president, and I believe the president haves not only one but a lot of issues to covered up. My question is If congress is so busy watching the president in which steps he does bad and which he does right. They also have the time to make a plan and offer it to president obama as a solution. I am pretty sure Obama is the most occupied man in government.